So much for the idea of "debate fatigue." Saturday night's GOP demolition derby on CBS was the highest rated primary debate since December, according to Nielsen. The fiery contest between six Republican contenders easily out-rated the two person Democratic debate earlier in the week, once again affirming that Donald Trump and his GOP rivals are bigger draws than Hillary Clinton and Bernie Sanders. CBS averaged 13.5 million viewers between 9 and 11 pm, surpassing the 13.3 million who tuned in for last Saturday's Republican debate on ABC. The other GOP debates so far this year have averaged 11 million (on Fox Business in mid January) and 12.5 million (on Fox News in late January). For comparison's sake, Thursday's Democratic match-up on PBS and CNN totaled 8 million viewers between the two channels. Overall, Saturday night's CBS event was the most-watched debate since the CNN Republican debate in Las Vegas in mid-December, which had 18 million viewers. The overall record, 24 million for the Fox News GOP debate last August, remains unchallenged. Saturday's debate was arguably the most consequential and timely meeting of the Republican candidates yet, coming on the heels of Supreme Court justice Antonin Scalia death and Donald Trump's win in New Hampshire on Tuesday. Some commentators compared the wild back and forth to a WWE wrestling match. 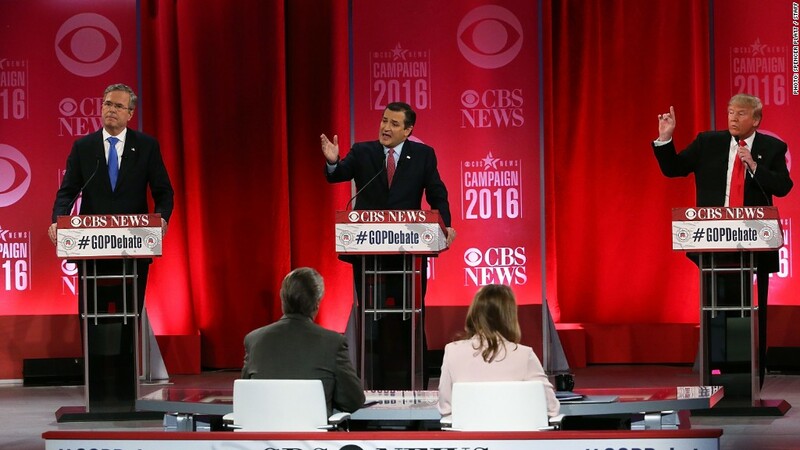 CBS said the two-hour debate "reached its peak audience between 10:00-10:30 p.m. ET," when 14.6 million viewers were tuned in. CBS also said its live streaming service, CBSN, had more than two million video streams during the debate, but the Internet numbers are not comparable to the TV ratings. John Dickerson moderated Saturday's debate. CBS correspondent Major Garrett and The Wall Street Journal editorial board member Kimberley Strassel also asked questions. The next GOP debate will be televised by CNN on February 25. Correction: An earlier version of this article reported the incorrect viewership for the CNN debate in December. The debate had 18 million viewers.